Fully self contained 2 Bedroom 1 bathroom max 4 guests plus baby. Luxury Executive Apartment in the Oaks at Broome's beautiful Cable Beach.. This luxury two bedroom 91m2 unit with King size double bed & two King size singles that can be zipped together to make a double king, plus Porta-Cot for baby. Tea & Nespresso coffee machine with Pods supplied for your stay, combination room safe. Iron & ironing board, hair dryer and much more for your convenience. 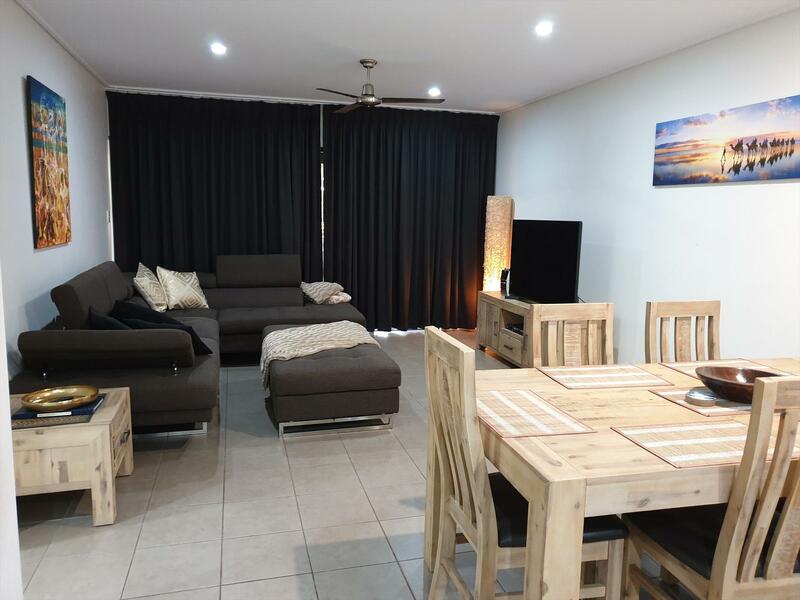 Nearby this Luxury unit are top class restaurants, Camel ride on Cable Beach, Divers Tavern, beach front restaurants and other night life in the town centre. You’ll love our place because of the safety, the quietness, ambience, massive pool and kids pool. Fully self contained with all cutlery supplied, large fridge, microwave, hot plate & oven. Outside communal barbecue a few meters away overlooking the Lagoon pool. TV's in both bedrooms and large screen TV in lounge to enjoy Foxtel or local TV stations. Our unit is good for couples, overseas travelers and families with kids of all ages. There are 2 heated swimming pools available for our guests in the resort to use. Two bedroom fully self-contained unit, located withing the the beautiful maintained Oaks Cable Beach. 2nd bedroom has 2 king single beds that can be zipped together to create a king bed. We do have a cot available at no extra charge, please advise if you will be needing this. With an onsite bar & restaurant, you have the option of self-catering or dinning out. Full refund if cancelled within 48hrs after booking. 50% refund if cancelled 60days or more before check in. No refund if cancelled less than 60 days before check in.